Playing under a bright blue sky, his side started slowly, their initial play proving somewhat less sparkling than the welcome August sunshine. With the excellent Hayden and Merino impressing in central midfield, they were the better side but took time to make their final ball count. 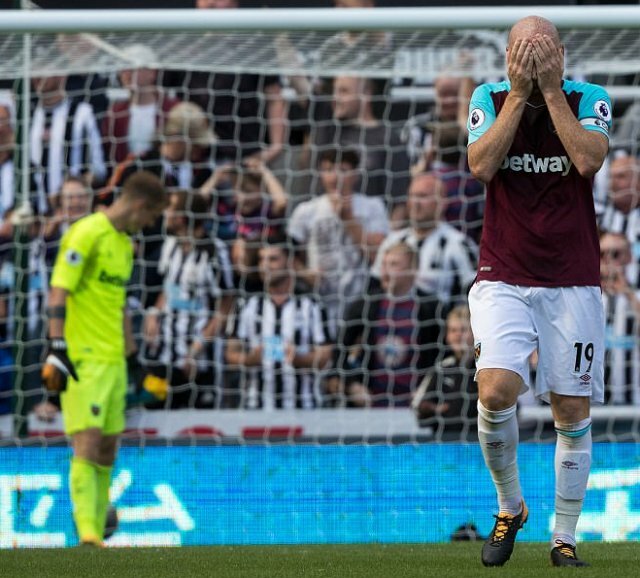 Then, just as the atmosphere among another full house began turning edgy, Bilic�s 18-year-old midfielder Declan Rice lost possession to Ritchie and Merino�s inspired through ball picked out Christian Atsu. The winger squared unselfishly for the hard-working Joselu who, under pressure from two defenders, extended his right boot to give them the lead from close range. Thanks to that moment of incision on the part of his �5m signing from Stoke, a look of something resembling mild contentment flickered across Ben�tez�s face. Newcastle�s first league goal of the season seemed to remove much of the early tension from their play, dictating that passes were no longer snatched or mis-placed. Indeed, by half time they were settling into something approaching a rhythmic passing groove. Poor Rice looked out of his depth and it came as no surprise when he was replaced by Manuel Lanzini at the interval. Not that this switch had much impact on the balance of power as Newcastle�s continued superiority manifested itself in Joselu � by now heading for cult-hero status among the Gallowgate End � creating a chance for Ayoze P�rez, whose left-foot shot was well saved by Joe Hart. Shortly afterwards Ben�tez�s players weathered a pivotal moment. This time, the otherwise barely troubled Rob Elliot was the goalkeeper being stretched to the limit, performing wonders to repel Aaron Cresswell�s ferocious shot before Clark cleared Javier Hern�ndez�s follow up off the line. Suitably warned, Newcastle upped their tempo and, in a near symmetrical cameo at the other end, Hart saved smartly from Ritchie with Pablo Zabaleta scooping off the line to deny Joselu a tap in. No sooner had the tiring Spanish centre-forward departed to a standing ovation � to be replaced by Aleksandar Mitrovic � than his side scored again. This time Ritchie danced past Lanzini before crossing sublimely for Clark to beat Hart with a header which went in off a post. Considering Clark, deployed out of position at left-back, had enjoyed an outstanding afternoon in defence there could hardly have been a more appropriate scorer.